This dissertation is a thorough investigation of the syntax, semantics, and typology of modal existential wh-constructions the last major type of wh-construction (next to questions and relative clauses) that is still relatively poorly understood. The author argues that their proper analysis enhances our understanding of a variety of richly discussed issues, including the syntax- semantics of argument structure, event structure, existential predicates, wh-movement, covert modality, and obligatory control. 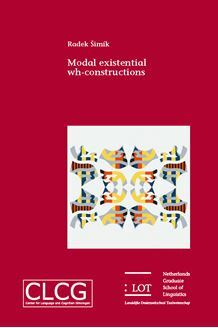 The author argues for a radically new approach to modal existential wh-con­structions. His core idea is that they are not ordinary objects of the verb which they are selected by (a predicate expressing the state of existence or availability, or a complex predicate leading to such a state), as previously assumed, but rather constitute an additional independent argument. This argument is an integral part of the complex event structure of the matrix verb its “event extension” and as such characterizes possible developments of the state or event denoted by the matrix predicate. The proposed analysis accounts for many apparently unmotivated properties of these constructions, including their highly restricted scope, modality, and syntactic distribution on the one hand, and a relative freedom of their internal syntactic shape on the other. The analysis also reveals a previously unobserved but remarkably tight relationship between modal existential wh-constructions and English purpose clauses. This dissertation is of interest to theoretically and typologically oriented linguists working on wh-constructions, purpose clauses, existential sentences, event structure, and modality. On a more general level, it deals with issues at the syntax-semantics and syntax-pragmatics interface.